One of my favorite smoothies is when there is an abundance of fruit – and I mean a variety of fruits that I really love. Yes I know they all taste great on their own but I love putting them all together in one glass. Seriously for me it’s like a treat or a sundae. This is why I love a classic berry smoothie. Not only do I fulfill my desire for more than one berry at once, I can also amp it up a little with some added ingredients that get disguised in the mix. So to the eye and palette very much berry, berry and berry, but to the rest of the body, lots of yummy nutrients that I need or am trying to get in! 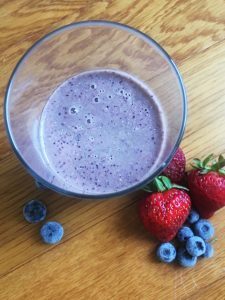 This is especially good for kids who naturally love sweeter smoothies and will be all over drinking this. They will enjoy it and you will be happy that you got that other stuff in there (I feel especially successful when I’ve gotten some greens into them first thing in the morning). My daughter, in particular likes this smoothie and will gulp it down very quickly. 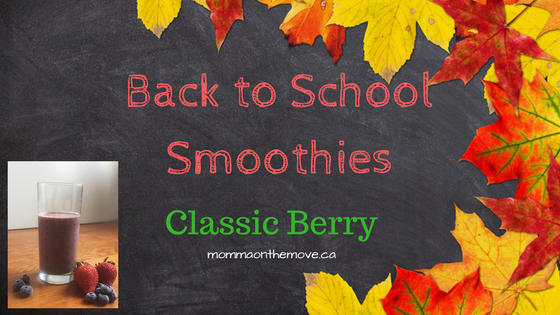 Now I know in the first post in this back to school smoothie series I recommended go easy on the fruit, as it can create too much sugar (even if it is natural) in the body first thing in the morning. The key is that with the other ingredients we are adding this quickly balances it out and stabilizes the higher sugars that you get from the higher fruit content. Plus because we are blending and not juicing you still get the fiber from the fruits which also helps to counter balance the sugars. And well let’s be honest, it tastes good! And every once in a while we deserve a little treat. Put all ingredients in the blender and mix until smooth. Now if you prefer more blueberry to strawberry or raspberry, feel free to adjust the amounts accordingly. You may also substitute chia seeds for hemp seeds, just be aware that with chia seeds they can make it much thicker especially if not drunk right away. Perfect for the morning and to add that variety to the morning smoothie menu. 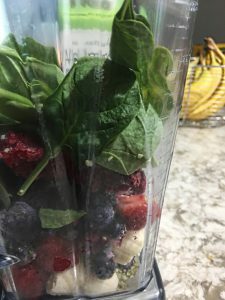 This entry was posted in Breakfast, Healthy Eating, Recipes, Smoothies and tagged back to school, cooking with kids, healthy breakfasts, smoothie recipes by Carmen. Bookmark the permalink.